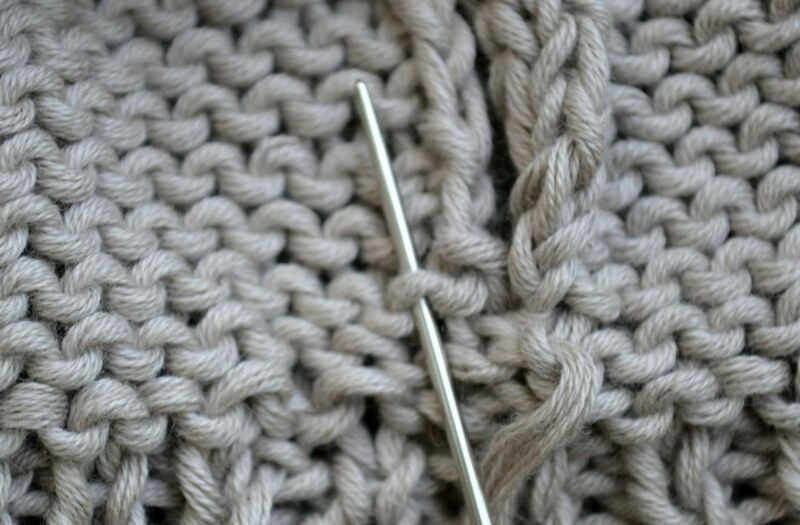 Most knitters who have worked garments in pieces know how to do mattress stitch, which is the name for the vertical seam in stockinette stitch projects that looks seamless from the right side when done correctly. But what if you've knit a project in a different stitch pattern that needs to be seamed, like reverse stockinette? You can't do the same move in this stitch pattern and have it come out right. It's actually pretty easy to seam reverse stockinette stitch once you know what you need to do. If you look at the fabric, you'll see purl bumps going in waves across the fabric. Some are at the top of the wave and some are at the bottom. When seaming in reverse stockinette, on one side you'll go through the top of the wave and through the bottom on the other. Start with right sides facing up and the pieces you need to seam next to each other. The photo shows a start with going into the left side first and into the top part of the wave, but it doesn't matter which way you do first or on which side as long as you are consistent. This is what it looks like when you go into the stitch. Once you've worked on one side of the piece, continue stitching into the other side and the other part of the "wave." In the case shown, the right-hand side piece of the garment is the location and the lower part of the wave is being stitched into. Some people call these smiles and frowns instead of a wave; if that visual works better for you, it may help you remember which part of the stitch you are working into each time. Continue working into the top or bottom of the wave consistently on each side of the project, pulling the working yarn snug every few stitches. Don't pull too tight because you don't want the fabric to bunch up. The goal is to bring the two sides of the project together so that the seam disappears but the fabric still has all the drape and flexibility that it would without a seam. This is exactly the same way you seam garter stitch or any other fabric where purl bumps predominate. Seaming basketweave? Switch between mattress stitch when you have knit stitches on the edge and this seam when you have purl stitches on the edge. It's really easy once you get going.